Many readers know that I have a very strongly held personal belief that each person has an absolute right to seek after and worship God as best he or she understands Him, or even to not believe in God at all. The one caveat is that a person's right to that ends where another's right to do likewise begins. I don't believe that what the South Park guys have done (or have ever done) violates that notion. So now it's Trey Parker and Matt Stone who have drawn the ire of a wacko Islamic website. What's the sacrilege this time? A depiction of the prophet Muhammad, shown above with South Park characters Stan and Kyle. In case you can't see him, Muhammad is hiding inside the bear suit. 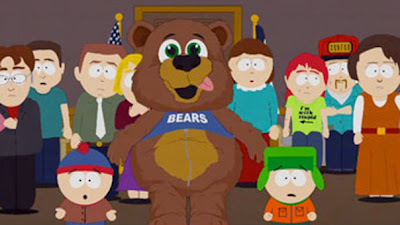 A radical Islamic website is warning the creators of "South Park" that they could face violent retribution for depicting the Prophet Muhammad in a bear suit during an episode broadcast on Comedy Central last week. RevolutionMuslim.com posted the warning following the 200th episode of Trey Parker and Matt Stone's "South Park," which included a caricature of the Prophet Muhammad disguised in a bear suit. The Web posting also included a graphic photo of Theo van Gogh, a Dutch filmmaker who was murdered in 2004 after making a documentary on violence against Muslim women. "We have to warn Matt and Trey that what they are doing is stupid and they will probably wind up like Theo Van Gogh for airing this show," the posting reads. "This is not a threat, but a warning of the reality of what will likely happen to them." Reaching by phone early Tuesday, Abu Talhah al Amrikee, the author of the post, said he wrote the entry to "raise awareness." He said the grisly photograph of van Gogh was meant to "explain the severity" of what Parker and Stone did by mocking Muhammad. "It's not a threat, but it really is a likely outcome," al Amrikee said, referring to the possibility that Parker and Stone could be murdered for mocking Muhammad. "They're going to be basically on a list in the back of the minds of a large number of Muslims. It's just the reality." Wait a sec: so Muhammad was not actually shown. We only saw a guy in a bear costume. But that the South Park kids pointed at him and called him "Muhammad" was enough to get Parker and Stone targeted for death?! I have to wonder if the same thing would happen to me if I were to, say, post a photo of Cap'n Crunch and write "this is Muhammad". Would some Islamic yahoo send me a threatening e-mail if I were to say that Yoda was really Muhammad? How about if I use an image of a pile of steaming dog excrement: "there is one god and this steaming pile of dog excrement is Muhammad his prophet!" 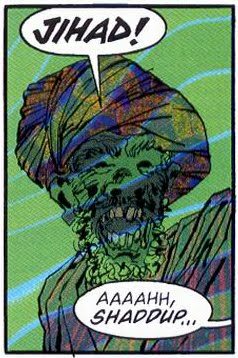 Mind ya, I'm not poking fun at Islam itself. But I darn well am saying that this is an example of some of Islam's followers acting like a pack of bloodthirsty thugs. What I said earlier about everyone has the right to worship God up until that right impinges on others' right to do the same? I sincerely believe that. And if it takes vigorous self-defense (read into that what you will) to deter followers of Islam or even of Christianity or any other religious adherent who refuses to respect the rights of others, then so be it. Now Chris we know Islam is the religion of peace! A piece of this and a piece of that, till we own all the pieces!